Why Does My Business Need Merchant Services? If you’re a new business, then you might be trying to find your footing. Between finding the right venue for your business and getting it off the ground, you probably feel overwhelmed. Let Journey Business Solutions help you regain your grasp on what’s going on in your business by offering up some more information to help. In some of our past blogs, we’ve covered payroll services and merchant services; however, if you’re a new business, then you might not know how you can benefit from some of these services. Even if you’re an older business, that might be evolving with the times may not know the benefits of some of the services we offer. 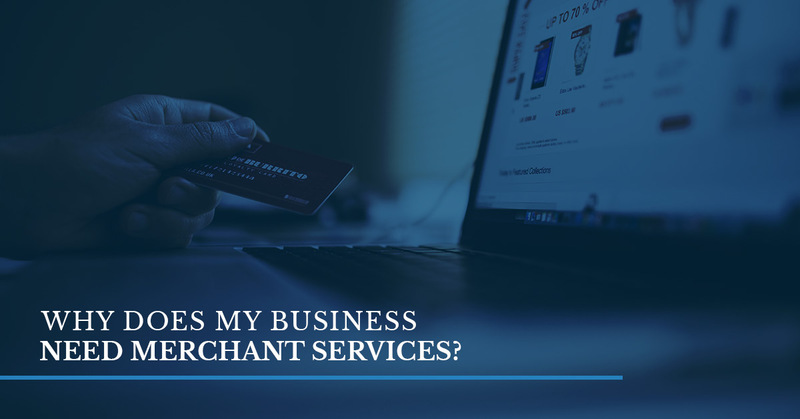 In today’s blog, we’ll be addressing the question of why does my business need merchant services? First, to understand why you need merchant services you need to understand what they are and what they entail to make them so important. Merchant services are what make your business easier to manage and your customers happier. With the introduction of credit cards and checks, cold hard cash isn’t the only type of monetary payment anymore, especially when most people only carry credit and debit cards. In addition, if you’re a business that has an online presence, then you need merchant services to keep you organized. Merchant services include credit card acceptance, lines of credit, and programs to help you manage your money better. These are important because they help your business in the long term increase sales, expand, and make managing everything that much more easy. When you consider why your business needs merchant services, what comes to mind? Do you think about how running your business will be easier? Do you consider how you’ll get more money by accepting credit cards? Do you think about how you can make your customers happier by your business choices? Merchant services are geared to help your business be the best it can be. You’ve poured your time, energy, money, and work into your business, so wouldn’t you want to sustain it? If you’re still wondering why merchant services are a great way to enhance your business, then continue reading about the many benefits you can utilize with merchant services. Keep in mind that merchant services are made to be advantageous. At Journey Business Solutions, we know how hard you work, which is why we offer these easy-to-use services. The first advantage to using merchant services is how you can accept credit cards. It’s pretty exciting to know how much more money you can take in for your business when you accept the number one way people like to pay. Credits and debit cards are a huge advantage for customers who can use them to purchase products from your company. Additionally, you can make your online presence a lot more vibrant when you accept credit and debit cards. By providing the acceptance of credit and debit cards, you can open up your business to an entirely new type of customer. When you accept credit and debit cards, people are much more liable to come to your business because they don’t have to worry about having cash or a check on them. Furthermore, having the ability to pay with a credit card will legitimize your business. Credit cards will also increase the sales for your business. Merchant services will allow you to use a variety of different types of monetary payments. Customers will spend more money when they are able to use credit and debit cards. Credit and debit cards tend to be a way to pay without people realizing how much they are spending. For example, if someone has $100 and they spend 50 of it, then their wallet will feel lighter and the amount they spent weighs much longer in their mind. On the other hand, when you use a credit card, your wallet stays the same in heaviness and you have to check your bank or a receipt to figure out how much you’ve spent or how much is in your bank account. In addition, merchant services will increase sales because you offer a credit card acceptance option. People have a tendency to spend more money indirectly when there’s the option to pay with a card. Consider your own spending habits when you have cash versus a credit or debit card. Lastly, merchant services make for better customer service. Customer satisfaction is very important to help people come back to a business. If you go into a business and receive terrible customer service, would you want to return? Customer service can sometimes be the leading factor to return to certain businesses. The correlation between customer service and merchant services comes down to the fact that you’re offering an additional option for paying for the products. If you go into a store to buy groceries and find they don’t accept credit cards when you only have cards, will you be happy? Probably not. The end goal of merchant services is to create customer satisfaction. By having options, making it easier to pay, and creating a safe and dependable environment for shopping both online and in a brick and mortar store, you’re making your customers very happy and, in turn, they will be very willing to return to your business. Why Do Companies Outsource Their Payroll Services? For further information about our services and how they can help you, continue to read our blog. Founded with the sole intention of providing solutions that help your business grow, our mission is to show you what it takes to reach success. As your one-stop business solution shop, you can count on us for merchant and payroll services. ©2019 Journey Business Solutions is powered by PayProTec.